70 p., 1 leaf of plates : ill. (some col.) ; 16 cm. William P. Nimmo & Co.
school I 1C iI-h o( "
his privilege and overrun the whole house. it was through him that our first dog came. 6 Stories About Our Dogs. mustn't let anything hurt him." stroking his rough, tawny back, and hugging him. and do duty by watching and guarding the place. 8 Stories About Our Dogs. of his rough tail are not to be described. that even all our attentions could scarcely satisfy. the night to steal away our treasure. 10 Stories About Our Dogs. the fence with a great bound, and ran after it. he turned away, and trotted dejectedly home. and memory than this one action ? which I shall tell you in the next chapter. 12 Stories About Our Dogs. screaming threats and maledictions on the robber. had done with his spoils. and in truth a very handsome dog he was. 14 Stories About Our Dogs. with the murdered duck tied round his neck. mind, before he really knew what he was about. looks and good qualities could not save him. of saving his life. "Rover, you naughty dog! us for praise at his extraordinary good conduct. tuous assurance quite edifying to behold. 16 Stories About Our Dogs. of running races and cutting capers with the rail. road engines as they passed near our dwelling. and making the very ground shake under him.
" Where's our dog ?-what's become of Rover 1"
pets, must take special care of our Rover. alone at home, his low spirits were really pitiful. 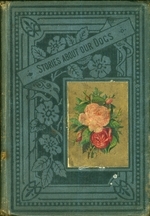 18 Stories About Our Dogs. long, as his offering of joy. twice a day, as regularly as any theological student. outside the door on these occasions. 20 Stories About Our Dogs. not tl!e least of the pleasures of return. never would do so more. long before his friends will get another as true. to fancy to be an exact resemblance of our pet. winked very hard at his transgressions. 22 Stories A bout Our _logs. sented him by a man who was leaving the place. city of personal affection which were uncommon. Italian greyhound, that was living in doleful cap. 24 Stories About Our Dogs. a feather, was sufficiently amusing. 26 Stories About Our Dogs. would not take any nonsense from him. sitiveness to cold was one of his.great peculiarities. his initials were embroidered with their own hands. 28 Stories About Our Dogs. won for him caresses and attentions innumerable. own praises, like a gay buck of fashion as he was. the gate, and away down the street like the wind. 30 Stories About Our Dogs. she waa christened Florence, after her native city. quired petting and tending hourly. She was per. all the sight-seeing of the Eternal City. of the walls of Rome, called the Pamfili Doria. 82 Stories About Our Dogs. 3t Stories About Our Dogs. struggles in riding about Rome. we were contented to wait sitting in the carriage. as if it were only a crust over some terrible abyss. 30 Stores About Our Dogs. every now and then came from its depths. would express her mind on the subject by a sud. our compartment, and gazed about inquiringly. 38 Stories About Our Dogs. tached himself with the most faithful devotion. the names of Milton and Beethoven. they vanished from this life. happy as if nothing had happened. napkins, and after that never had another attack. 40 Stories About Our Dojs. ing her opinion on their symptoms. faded, and the tablet has been forgotten. veneration all the movements of his mistress. few caresses would set matters all straight again. him screaming with disappointed ambition. tress, died at last in her arms. 4 Stories About Our Doas. which had gone before him. have,-so said Miss Jenny, our youngest. with a shock of rough tan-coloured hair. there ? Is he generally so playful ?" 44 Stories About Our Dogs. This cat, the most reputable and steady indi. cited. Thomas had but one trick of popularity. habits and a good conscience. respectable citizen going tranquilly to market. Jenny was making to subdue and quiet him. ing favourite, and it was vain to dispute his sway. it, that every feather in it was utterly demolished. 48 Stories About Our Dogs. and disposed of at a somewhat reduced price. in sporting gazettes as the most celebrated ratterr"
'The catalogue of our dogs ends with Wix. pets which may amuse them. about dogs and household pets in general. is the end of it. dog that is settled in life. which Sir Walter Scott tells about in The Talis. gent, and capable of being taught many tricks. recommended as out-door pets in barn and stable. boy with an air of great sagacity. b2 Stories About Our Dogs. the snow as if in quest of something. that are brought from the island of Manilla. is the entireness of their devotion to their master. shelter from the inclemency of the weather. you have no kennel for that poor creature." and warmth as much as anybody. the cat, and bring on convulsions. on the table to help herself. 56 Stories About Our Dogs. warmly commend her when she captured a mouse. as truly as any lover in an old ballad. one is only an annoyance. 58 Stories About Our Dogs. beings whom He thinks worthy of His protection. the poor animal sorrowfully at the same post. companied by his dog, on purpose to receive it. bag; but it was too heavy for him to drag along. and howling, seemed to remind him of his mistake. gan to bite his heels. this suspicion, in crossing a brook, he turned bac? I find any one to perform this cruel office for me! the victim if I spare him." and he has paid for his fidelity with his life." black, which brought customers to its master. in London some time, and then released him.